When your pet is ill, injured or under stress, the natural flow of energy in and around their body can become congested and out of balance. Since animals are integrated beings – body, mind, emotion and spirit – the interrupted flow of energy can negatively impact the way your animal feels, their emotions and their body’s ability to heal. 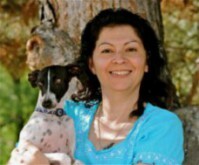 My name is Kim Gillaspie and I'm an Animal Communicator, Animal Energetic Bodyworker and Certified Canine Massage Therapist. My goal is to bring stress relief and optimal wellness to the lives of your pets. I use a multi-faceted approach to clear, balance, energize and support your pet’s body, emotional state and energy system, unleashing their own natural, restorative healing powers. The various therapies that I use in my sessions are gentle, heart-centered modalities that work along with traditional veterinary care so your animal can live a fuller, healthier, happier life. Whether you and your pet need help addressing a current issue or you just want to keep one step ahead by implementing a wellness program or having a heartfelt conversation to clear the air, I'm here to assist you. Please look around my website to find out a bit about me and what I do. You’ll find answers to many of the most common questions asked about Animal Communication and Energetic Healing. If you still have questions or want to schedule an appointment please visit the Contacts page to reach me. I look forward to hearing from you and your animal friends. © Copyright 2019 Pawsitive Energy . All rights reserved.